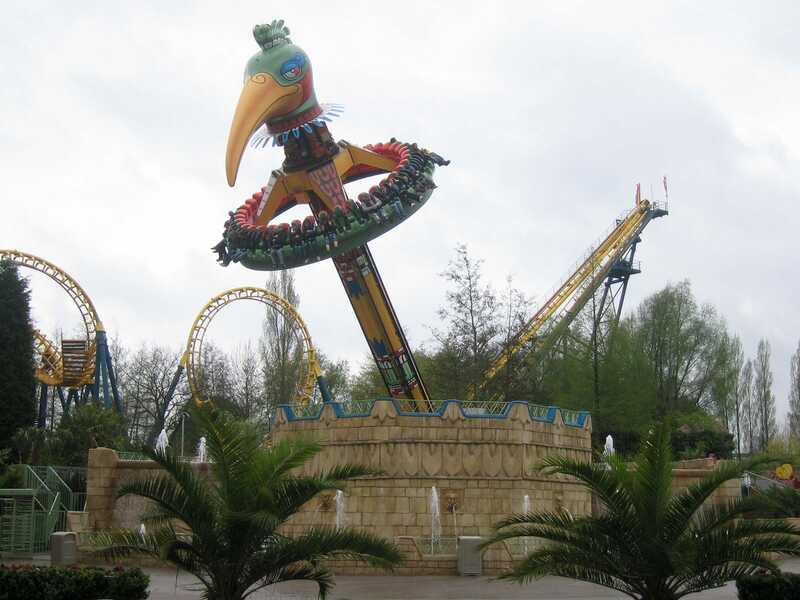 The name Plopsaland is perfectly acceptable in Flemish, though it inspires somewhat scatological thoughts in those brought up in English speaking countries. The misinterpretation isn't helped by the sight of the Plop Restaurant, and it is impossible not to snigger at the signage referring to younger visitors as Petit Plops. It was raining quite heavily when we arrived at the park, but fortunately the vast majority of the attractions were operational. The first one we arrived at was Vleermuis (#695), a double-track version of the Caripro Batflyer and one of just four rides of its type still in operation today. It was quite difficult to close the door on my car but I managed it, and I enjoyed the short ride even if the final brake felt something akin to a car crash. In the interests of completeness I rejoined the queue for a lap on the second track, though I'm quite content to count the entire attraction as a single credit; after all it would not be possible to separate the two sides as they share support columns. The newest coaster in the park is a powered model supplied by Mack Rides, and it is a wonderful ride. The queuing area for Draak is enclosed within a multi-level medieval castle that almost certainly cost more than the actual ride hardware. Once on the train, the layout features a series of helices that interact closely with the flume ride beneath. It is no exaggeration to describe the ride as my favourite in the park, though as the photo above implies I'd likely have enjoyed it even more if my glasses had been equipped with windscreen wipers! Our next stop was at the off-the-shelf Rollerskater (#696), the very first installation of the 335m Junior Coaster from Vekoma. The track on this model passed through a giant washing machine part way around the course, raising a rather curious question; perhaps my education has been lacking in some areas, but the idea of putting roller skates in a washing machine seems just a little odd to me. Is this taught in Belgian schools? New for this year is a Mack-built water coaster, SuperSplash (#697). We hadn't seen this ride operate at all, and as the park map said it was coming in May our natural assumption was that it wasn't open yet, even given that we had reached the first of that month. However, when we got to the entrance it became clear that the ride had indeed opened to the public. Boarding anything with a splashdown without seeing riders disembark is a gamble, though we decided that it was safe enough given that we were already pretty wet from the weather. The ride uses a vertical lift and turntable mechanism that is enclosed inside a themed building. 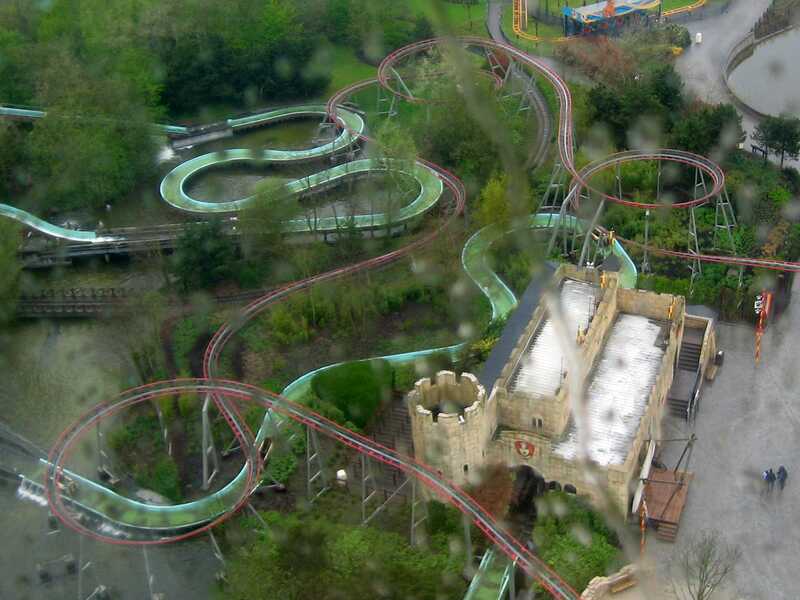 Once at the top a door opens and the boat slides out, down the large drop, over an airtime hill, and into the water. It turned out that most of the splash was deflected away from the boat. 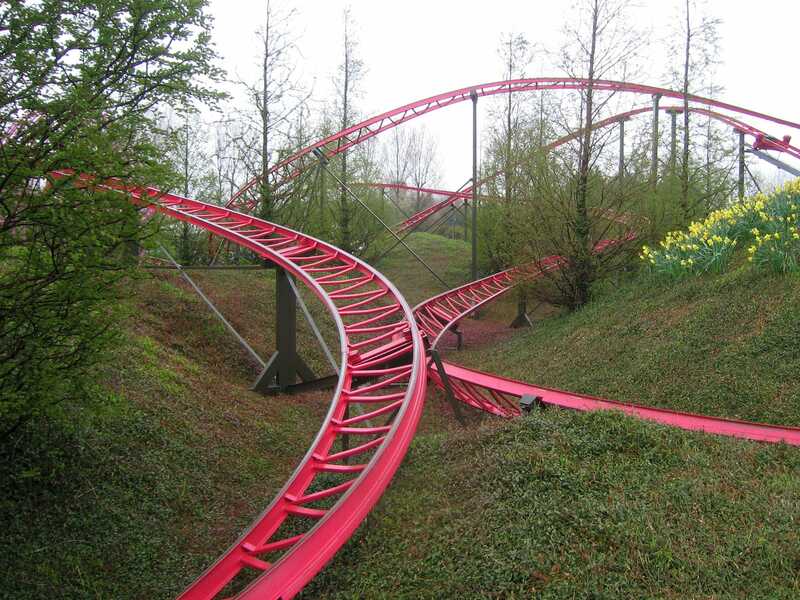 The final coaster in the park was temporarily down due to the conditions. However, the sky was beginning to clear, so we decided to kill some time by riding the Panoramic (observation tower), the Kasteel van Koning Samson (log flume, nicely themed), and a De Vaat (boat ride, dull as dishwater). In due course, Dongo's Race (#698) opened up, albeit only with four riders at a time; the tyre drive on the lift hill was clearly having a very bad morning. Once over the top however the ride felt like every other Tivoli, being a solid coaster if nothing to write home about. We were on the way to the exit when I spotted a dark ride which I'd somehow missed. Bos van Plop told the story of Plop and all of his gnome friends on a journey through a forest of goblins. The theming had the definite suggestion of budget constraints; some sections ot the ride were fantastically detailed, while others were quite sparse. The only motions were occasional blinking eyes; a few animatronics would have added considerably to the experience. I'd not had a chance to do advance research on Bellewaerde, and thus my first act on arrival was to look at the park map to determine where the coasters were. Both were apparently to the left of the entrance, and thus we headed off in that direction. It was almost twenty minutes later when we realised that the park had two entrances, and I'd referenced the wrong one. By that stage we'd basically arrived at Keverbaan (#699), the second large Tivoli of the day. Though the weather was still far from ideal this model had warmed up enough to use all seats on the train. We were treated to three full circuits, though I rather suspect that the third was unintentional; there were several seconds of tyre squeals as the train passed through the station, suggesting a failed attempt to brake. This meant that my seven hundredth coaster ended up being Boomerang (#700), and while this wouldn't have been my first choice (or for that matter my second, third, or nineteenth) the ride was better than expected, with no head-banging to speak of. One of the newest attractions at the park is El Volador, one of the first installations of a Huss Rides Topple Tower. The premise is simple; a ring of riders is lifted to the top of a tower, which then falls over sideways a few times. Unfortunately, the ride sounds (and for that matter looks) a lot more impressive than it actually is. The falling motion on the tower could be better regarded as a gentle descent, and the overall ride motion did nothing for me whatsoever. While it was interesting to ride once, it must be said that this is not one of Huss' finer machines, and is certainly not one worth making a special trip for. The most impressive attraction in the park by some margin is Los Piratas, a Mack-built dark ride that can be succinctly described as Disney's Pirates of the Caribbean without the irritating Yo-Ho-Ho song. The seven minute long ride operates using a fleet of sixteen seater boats that pass through a range of spectacular animatronic scenes. The experience reminded me very much of the similar ride at Europa Park, though the theming here was somewhat less elaborate. This brings me to a story which would normally not feature in my trip reports. Having had plenty to drink, I felt, as it were, the call of nature. Having located a suitable facility, I made my way there, only to find a somewhat odd scene in progress. A local teenager was in the midst of defecating into a urinal, while a female companion (inside the men's bathroom no less) documented the event using a camera phone. Perhaps this is some curious local custom, but whatever the case I elected to postpone my own, er, requirements until a later occasion. Instead, the final ports of call became two water rides, the River Splash flume (mediocre) and the Bengal Rapid River rapids (rather good). The latter featured relatively unusual articulated boats, which I have only come across at a small number of parks. The reason for this became clear mid way through the course, where the course became very rough, in a fashion which would likely cause ordinary boats to take on significant amounts of water.